It is 1994 and Québecois journalist and film maker Bernard (Luc Picard) is in Rwanda documenting the AIDS crisis. He is immediately taken with the beautiful Gentille (Fatou N’Diaye). In spite of their differences, Gentille and Bernard fall passionately in love and marry. When violence breaks out between Gentille’s people, the Hutu, and the Tutsi, the pair is separated by desperate circumstances and Bernard embarks on a challenging mission to find his wife. 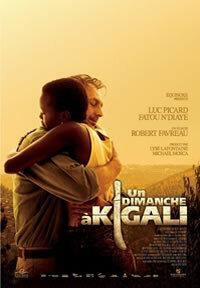 Resonating on many levels, Un Dimanche à Kigali addresses global politics, racial tension and powerful human emotions. It is set against the horrific Rwandan genocide, yet leaves viewers with the uplifting message that humanity is more capable of good than evil.